DREAM Act students march in front of the Arizona Capitol on Wednesday after Gov. Jan Brewer said the state will not give young undocumented immigrants who qualify for a deportation reprieve any public benefits, including driver's licenses. Legal experts say they expect a court challenge to Arizona Gov. Jan Brewer’s order denying driver’s licenses and public benefits to young undocumented immigrants who qualify to stay in the U.S. under a new Obama administration program. Brewer on Wednesday signed an executive order reiterating that state agencies are required to deny licenses and other taxpayer-funded public benefits to “unlawfully present aliens.” That includes those undocumented immigrants who are approved to stay and work in the U.S. for another two years under the federal government’s new Deferred Action for Childhood Arrivals program. “The issuance of Deferred Action or Deferred Action USCIS employment authorization documents to unlawfully present aliens does not confer upon them any lawful or authorized status and does not entitle them to any additional public benefit,” Brewer’s order said. Wednesday was the first day that certain immigrants who arrived in the U.S. unlawfully as children could apply for the right to stay in the U.S. for two years, with possibility of renewal, without being deported. To be eligible, immigrants must prove they arrived in the U.S. before they turned 16, are 30 or younger, have been living in the country at least five years and are in school or graduated or served in the military. They cannot have been convicted of certain crimes or otherwise pose a safety threat. In addition to driver’s licenses, Brewer's order bars undocumented immigrants who qualify for the deportation reprieve from public benefits that include state-subsidized child care; KidsCare, a children's health-insurance program; unemployment benefits; business and professional licenses and government contracts, Brewer spokesman Matthew Benson told The Republic newspaper. President Obama's new program covers more than 1 million people brought to the U.S. as illegal immigrants. Applicants around the country say they no longer have to live in the shadows. NBC's Mark Potter reports. "As the (Department of Homeland Security) has said repeatedly ... these individuals do not have lawful status," Benson told The Republic. "They are able to remain in the country and not be deported and not be prosecuted, but they do not have lawful status." Evelyn Cruz, an Arizona State University clinical law professor and director of the Immigration Law & Policy Clinic, said she expects a legal challenge because Brewer’s order might conflict with federal statutes. “Whenever you have something murky you’re going to have lawsuit,” she told NBC News on Thursday. Cruz noted that the REAL ID Act of 2005, a federal law that modified requirements for state driver’s licenses and ID cards, specifically listed immigrants who have been granted “deferred action” as among groups of people eligible for a license. “For something this significant I would not be surprised if there were multiple groups that end up challenging this order,” said Regina Jefferies, a Phoenix immigration lawyer and chair of the Arizona chapter of the American Immigration Lawyers Association. She said Brewer’s order conflicts with both state and federal law. Immigrants in Arizona have in the past been granted “deferred action” for other reasons long before the new Childhood Arrivals program was announced, Jefferies said. “Brewer quoted the correct statute but problem is the state laws interchangeably use ‘legal status’ and ‘lawful presence’ like they mean the same thing. They don’t. They mean very different things under federal immigration law,” she said. In contrast, California's Department of Motor Vehicles says it will issue driver's licenses to young illegal immigrants once the Obama administration grants them work permits. A 1993 California law bans driver's licenses for illegal immigrants, but the DMV will treat as "temporary legal residents" anyone who qualifies for the deportation relief program, meaning the state ban won't apply to them, DMV spokesman Mike Marando said Wednesday, according to an article in the Mercury News. Arizona immigrant groups upset with Brewer’s directive marched to the state Capitol on Wednesday night in protest. 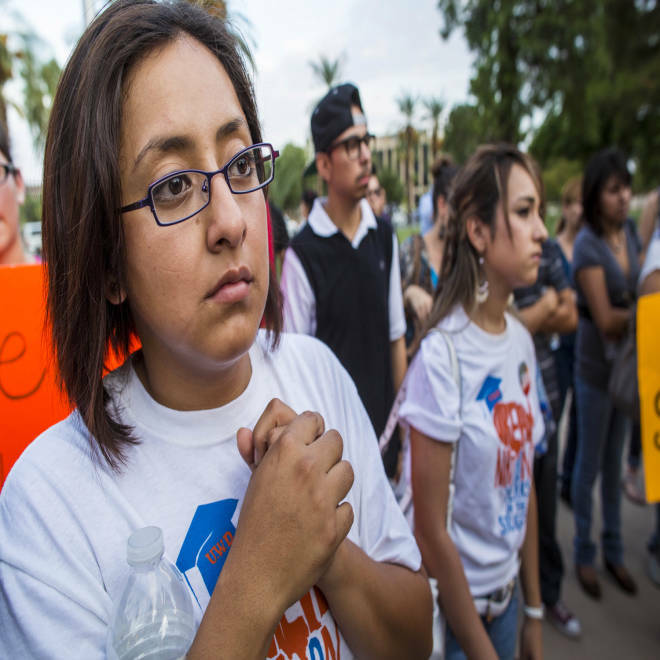 "She shattered my dreams today," said one of the protesters, Lorenzo Santillan, 24, of the Arizona Dream Act Coalition, The Republic reported. Arizona passed one of the nation’s toughest anti-illegal immigration laws in the country, SB 1070, in 2010 and Brewer, a harsh critic of President Barack Obama's immigration policy, has characterized Obama’s new deferral program as amnesty. The U.S. Supreme Court in June struck down key provisions of the Arizona law but let stand one requiring police to check the status of someone they suspect is not in the United States legally.